The feral pigeon is the number one urban pest bird. Large numbers exist in every city across the country. Not a native bird, feral pigeons are descendants of domestic homing pigeons brought over from Europe and released here in the 1600s. They were domesticated from the wild rock doves from the sea cliffs of Europe by the Romans over two thousand years ago. Several traits have allowed them to dominate the urban landscape. Because of their history, pigeons are not afraid of people; they roost and nest readily in man made structures and they have a diverse diet. Pigeons have a dark bluish-gray head, neck, and chest with glossy yellowish, greenish, and reddish-purple iridescence along its neck and wing feathers. There are two narrow black wing bands and a broad black terminal tail band. The females tend to show less iridescence than the males. The bill is dark grayish-pink. The pigeon and dove sing a similar repetitive cooing, "coo-a-roo, coo-roo-coooo". Hear It Now! Feral pigeons are responsible for untold millions of dollars of damage each year in urban areas. The uric acid in their feces is highly corrosive. Also, debris from roosting flocks can build up, backing up gutters and drains thus causing damage to roofs and other structures. Extensive damage to air conditioning units and other roof top machinery is commonplace. Pigeon droppings deface and accelerate the deterioration of buildings and increase the cost of maintenance. Pigeon manure deposited on park benches, statues, cars, and unwary pedestrians is aesthetically displeasing. Around grain handling facilities, pigeons consume and contaminate large quantities of food destined for human or livestock consumption. Besides physical damage, the bacteria, fungal agents and ectoparasites found in pigeon droppings sometimes represent a health risk. Large amounts of droppings may kill vegetation and produce an objectionable odor. Pigeons may carry and spread diseases to people and livestock through their droppings. They are known to carry or transmit pigeon ornithosis, encephalitis, Newcastle disease, cryptococcosis, toxoplasmosis, salmonella food poisoning, and several other diseases. Additionally, under the right conditions pigeon manure may harbor airborne spores of the causal agent of histoplasmosis, a systemic fungus disease that can infect humans. The ectoparasites of pigeons include various species of fleas, lice, mites, ticks, and other biting insects, some of which readily bite people. Some insects that inhabit the nests of pigeons are also fabric pests and/or pantry pests. The northern fowl mite found on pigeons is an important poultry pest. Pigeons are not protected by Fed. Government. 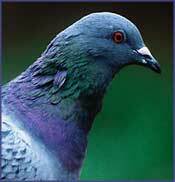 There are a wide variety of solutions available for handling a pigeon infestation. The best solution for pigeon problems, is complete exclusion with BirdNet netting. Many ledge and beam problems can be solved by using products such as Flock Off Gel and Flock Off" UV Paint together, Bird Stop or Bird Needle Spikes. When bird pressure is heavy in an area, exclusion work must be accompanied by flock dispersal methods like trapping or use of moving predator deterrents like the Prowler Owl and Bird Bopper visual repellent. Ultrasonic and sonic repellers are extremely effective. Shock Tape for ledges and sills is another option. Sting-'Em bird gel is an irritant sticky gel to prevent pigeons roosting on flat surfaces. Our Tweetzilla Bird Hazer is one of the most effective devices we have for repelling pigeons. Flock dispersal alone is not a long term solution especially in medium-heavy pressure situations like when there are food/water/shelter sources at the site. One vital component to pigeon removal is to modify their habitat by eliminating food supply. Discourage people from feeding pigeons in public areas. Clean up spilled grain around elevators, feed mills, and railcar clean-out areas. Eliminate standing water. See our complete list below of recommended bird deterrent products to repel pigeons. A "synergy" or combination of bird repellent products typically offer the most successful solution for repelling pigeons. For bird control solutions, we often recommend using companion products by combining electronic sonic repeller devices or bird hazers with visual scare deterrents, physical bird barriers or scent and taste aversion products. This kind of multi-sensory attack is extremely effective in deterring pest pigeons and doves for good!